Students should already have their hands full with their studies and academic responsibilities. However, some welcome the challenge of taking up both academic responsibilities and the real world. Either it is by passion or need, some students need to earn money while studying. It is their entrepreneurial spirit that drives them to become financially successful early in life. 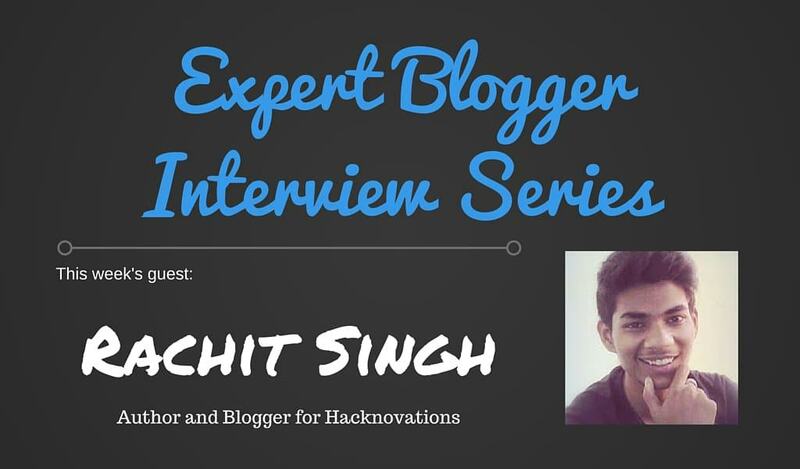 Rachit Singh is one of these students who thrives in blogging while studying at the same time. It is through his dedication to his craft that he has developed numerous blogs over the years, as he soon makes his way to college. Find out how he juggles his blogging careers with the challenges presented by school and experiences he is just experiencing now. Any client horror stories you’d like to share with us and how you dealt with the situation? If there’s one advice that you would say to a starting blogger, what would it be? Not many people know about this. In fact, only a small percentage of my friends know this. However, I think now is the time to open things up. I’ve always been a bright student at the school. I was introduced to Computer in 6th standard. Right after this I started taking an interest in all sorts of games. Image taken from Rachit’s About page. Later on, My father bought me a book about HTML. So, before completing 6th, I made an HTML website. Next step was to make it online for everyone. I started researching and found terms like domain name and web hosting. Things like this were happening, and I came to 7th. In 7th I discovered Blogger. Google’s free tool allowed me to make what I called websites easier. I started writing about random stuff. At the end of 8th standard, I started a blog about cracked software and patches. I maintained it a complete year. Then the main story dived in. In 9th standard, a Girl came in our class. She used to be my crush. With the time, I discovered myself to be a part of a group. We were five friends, best friends. Things were going smooth until a boy in our group messed things up. I was very much connected to that group. Then it happened what goes on in a movie; usually, the whole group left me for the girl. I was left alone. No friends, no fun. Then I started spending more and more time with my laptop. I started taking blogging more seriously. Due to the fight, I had lost interest in studies, I did not want to lose interest in blogging too. I Kept on blogging and Finally decided to make a new and recent blog. In the meantime, I had learned quite many things about blogging. So, I thought a blog about blogging would be nice. I had no distractions, and hence, much time to learn. This is how I dived into blogging. It is not easy finding time for this sort of stuff when you are a student. However, you know When you are passionate about something, time seems to be on your side. I find myself compromising studies a bit for blogging. I have made a schedule for me, and I try hard following it. Blogging is like one of those things I love doing, so Finding time is not that much hard. The other side is my grades are falling dramatically. Hahaha .. I Still believe myself to be a beginner. I honestly consider myself to be a beginner. I am still learning things and several aspects of business and blogging. However, returning to the question, the biggest obstacle I had to overcome was getting my parents to believe that I am serious about this. One more thing I found troubling was getting into the spotlight. The hardest job is to get from zero to one, once you are there, things get smooth. I spent several months, before making my blog a regular income stream. Yes, I’d love to share the story of one of my clients. Not horror, but he was irritating. You know; around 10th standard, I had started website building services. One of my clients came from nearby society. He wanted a website for his music school. I agreed to make one. Now, When I started, problems dived in slowly. He was very selective in the case of colors. I still remember, I would have spent nearly a week deciding only colors. He wanted everything to be of different color. Once the website was finished, he told me I had messed up with colors and website looked like a rainbow. The irony has he had selected all colors himself. Then I spend another three days changing whole site’s colors. The good part is he agreed to that final website. There is no such post. If you would have asked me which post makes me proud, it is this post. I have been blogging for quite a while and have been working with several bloggers. Out of the bloggers I have talked with or worked with, I like Rakesh Kumar, Neil Patel, Rahul Gupta, Sachin Saini, Joy Healey, Piyush Ranjan. I cannot miss you. You are one of those persons; I like talking with. It is not for the sake of the post; you are really on the list. The people I mentioned above have helped me in blogging. Rakesh Kumar has taught me how theme development is done in WordPress and introduced me to that new arena. Neil Patel has always been providing me valuable information regarding my startup plan. You have helped me sharpen my content writing skills, and the rest have helped me become a better blogger by being there as support. I’ll not come to the age factor here. The thing I believe which I find different in me and other bloggers is I have strong dedication and kind of stubbornness for this passion. Once I decide I have to do a particular thing, then I devote my complete attention to it. Co-bloggers always ask if I have been to a coaching for all this. I have never learned all these things. The rules of business, the funds of money making, the hack plans of blogging, all come to me due to my passion. Other than this, there is one more thing. I have interest and sufficient knowledge of several other topics as well. Often people end up saying “Get a life” to bloggers. This is something you cannot tell me. Seems that you are in luck, You can get the list of tools I use at http://rachitsingh.net/resources/. A screenshot of Rachit’s many blogs, Hacknovations. Honestly, I do not think my blog is successful yet. I am still learning as I told and grew it. It does not matter how much revenue it is generating; I am growing it regarding reader’s trust. With the time, I am providing more value to readers. I’ve grown up from a “300” word post blogger to “1500” word post blogger and I am still tweaking myself. So, I guess I still have to work hard to grow my blog. Although, My blog is not so bad. I have pretty decent traffic, and readers often engage with me. I get hundreds of emails asking about various stuff. All I know is I am growing, and I always will be. The most growing trend in blogging industry is video marketing. websites are making good use of it to grow their list. Also, another growing trend is going to be webinars. Video marketing is a rapidly growing trend. I know this because I have been providing video making services on freelancer websites and from the last few months, I have observed a decent growth in orders directly related to blogging and marketing. There is only one advice I would give to a newbie. Not only blogging, If you keep striking, but there is also nothing you cannot achieve. Everything what I have learned, let it be the ins and outs of marketing, or lessons of SEO are all result of not giving up. When I started blogging, My friends started their blog too. Now I stand with a profitable website and their “Domain is available for sale”.